The Beaglebone Black is a credit card sized, low cost (US$45), low power use Linux computer designed for developers and hobbyists to use with their projects. While sharing many similarities with the Raspberry Pi, the Beaglebone Black is twice as fast and has other advantages over the Raspberry Pi, particularly the huge array of GPIO (general purpose input output) connections which can be used to take readings from sensors and control external devices. This makes it work like a combination of a Raspberry Pi and Arduino (or other microcontroller). Although the Raspberry Pi is cheaper than Beaglebone Black, you have to buy an SD card and put an operating system on it which adds to its overall costs. Beaglebone Black comes pre-loaded with an Angstrom Linux distribution which is stored in the 2GB of on board eMMC flash memory. There is also a Micro-SD slot on Beaglebone Black which gives expanded memory size and can be used to install a different operating system (Android, Ubuntu, and many others) if you want. 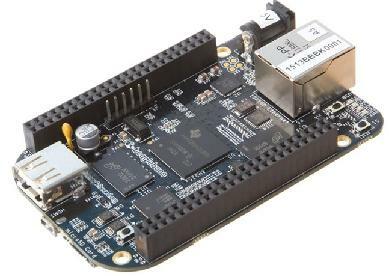 Beaglebone Black has 512MB of DDR3 RAM memory, a 10/100 ethernet port, a USB 2.0 port, and a micro-HDMI socket for connection to a television or monitor. The processor is a speedy 1GHz AM335x 1GHz ARM® Cortex-A8. In total there are 65 user accessible GPIO pins including 4 PWM outputs and 7 12-bit analog (ADC) inputs. Beaglebone Black is 88.4mm x 55.2mm x 19mm in size, and weighs just 40g excluding cables and micro-SD card if used. Beaglebone Black can easily be used as a very low power consumption stand-alone PC, with keyboard, monitor, and mouse attached via a powered USB hub to the Beaglebone Black. It allows for speedy browsing of even complex web pages via the Chromium web browser, word processing via AbiWord, and image processing using the Gimp image processor, and much more, all with open-source free software. For more advanced developers with Linux and programming experience, a Beaglebone Black can be used in embedded systems and programmed in Python, C, C++, Perl, Ruby, Java etc. 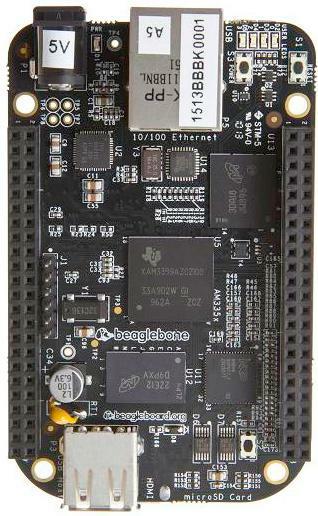 Click here to buy Beaglebone Black now. Click here for the official BeagleBoard.org website for more product information, forums, videos, and other support. Click here for details of our experiences with the Beaglebone Black.